Little Alexia is enjoying the spring sunshine more than most thanks to hundreds of generous children who helped to buy her a special stroller. The two-year-old was born with Cerebral Palsy and was previously excluded from simple activities like play groups or walks outside with her family because of her condition. But last year she was a grant recipient of the JMF Kids 4 Kids Challenge and as a result, was gifted with an appropriate stroller that provides the support her little body needs. Mum, Valia, said the stroller seemed like a small thing but it had been life-changing for Alexia and her family. 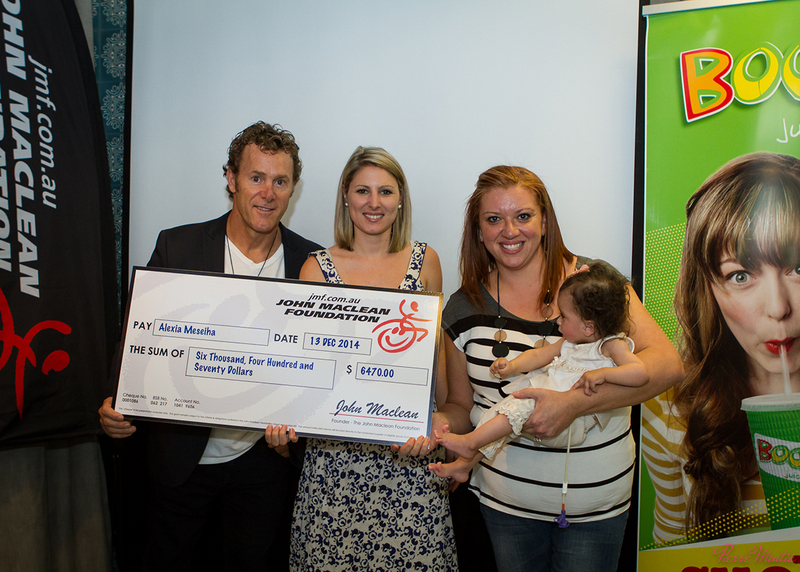 “JMF has provided our family with an amazing gift, a specialised pram for Alexia who has cerebral palsy,” (mum) said. “The pram has changed our lives and has given Alexia an opportunity to see life while safely and comfortable supported in the pram. She loves being outdoors and this pram has made that possible. 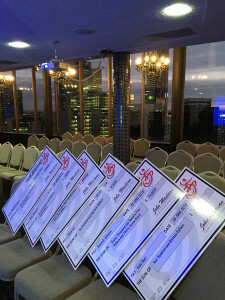 This year, The Boost Foundation is supporting JMF Kids 4 Kids and Big Kids 4 Kids for the second time and together we are aiming to raise enough money to give grants to over 20 families nationally. “JMF is changing lives for families all over Australia and we’re so honoured and proud to be a part of this amazing work,” Adam Neill, General Manager of Boost Juice, said. “Living without disabilities, it’s easy to take for granted simple things like being able to go where you want to go, when you want to go there. But if you need special equipment to help you do that and you don’t have access to it, just getting around can be a major challenge and it can really limit what families are able to do together. 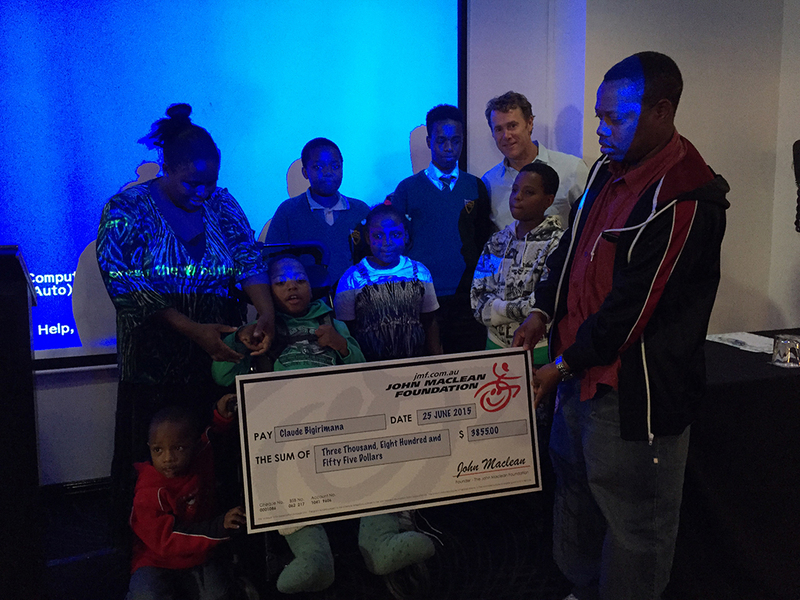 On Saturday Sept 5, 2015 The John Maclean Foundation’s JMF Kids 4 Kids and Big Kids 4 Kids program kicks off for another year. JMF Kids 4 Kids and big Kids 4 Kids is a fun and active way for adults and children to work towards completing an Ironman distance triathlon over a 4, 8 or 12 week period. 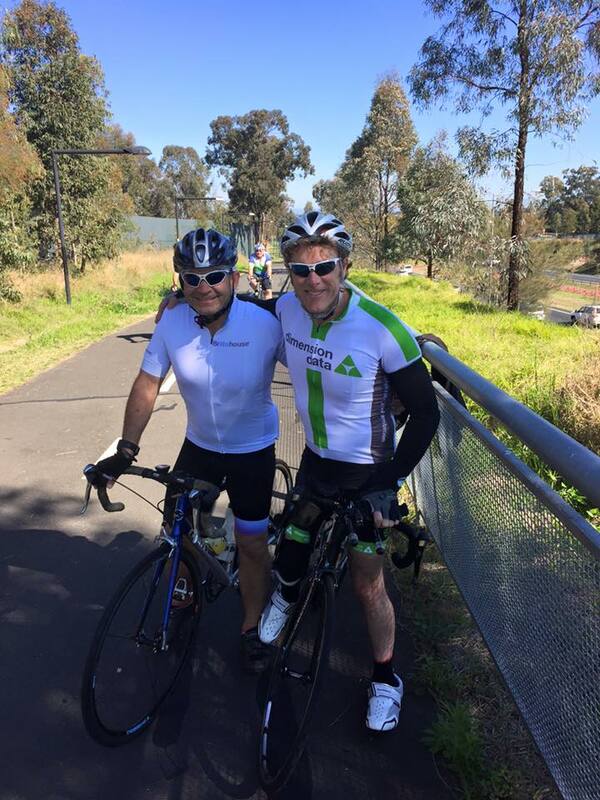 Every week participants swim, bike and run a little whilst logging their km and raising money to grant little wheelies the basic equipment they need to remain active and included in their everyday lives. This challenge is not a race, it is about encouraging healthy lifestyles in children and adults with the knowledge they are helping to change the lives of children like Alexia who live in wheelchairs. KM’s can be accumulated whilst playing weekend sports like footy, soccer, netball, basketball or whilst riding to school/work or taking swimming lessons. It is all about giving it your best shot. At the conclusion of the program participants are invited to join the Foundation at a grant presentation where they will be awarded their finishers T-Shirts, presented their medals and finishers certificates and most importantly meet the children and the families like Alexia the money they have raised has helped. CEO of The John Maclean Foundation, Tiffany Loftus-Hills said today “Without the support and generosity of Companies like BOOST, JMF could not touch the lives of as many families as we do. JMF has added Big Kids 4 Kids to this year’s challenge. Big Kids 4 Kids enables adults to get involved and cover the Ironman distance triathlon over 12, eight or four weeks whilst raising money along the way. 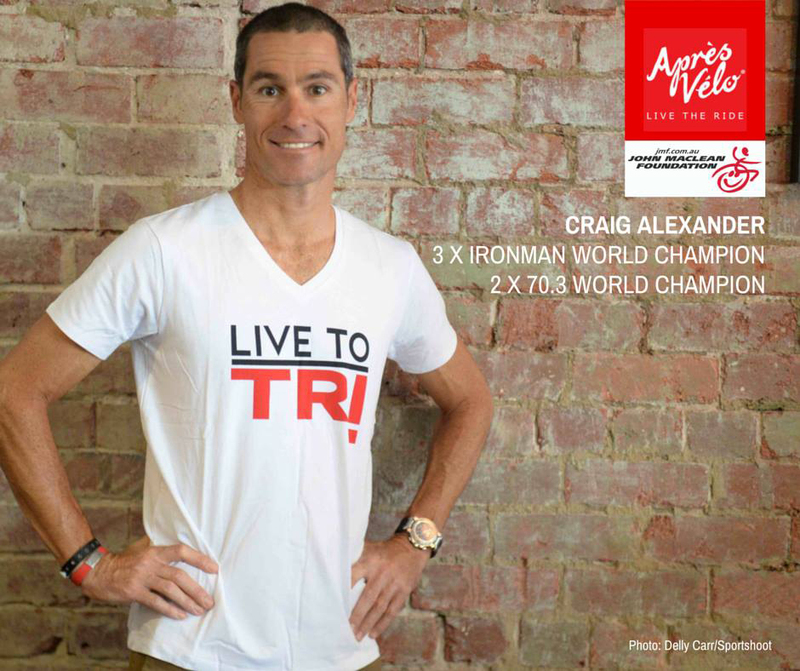 It’s a great way to get active, take on a challenge and either together with friends or on your own become Ironman. To get involved register at JMFKIDS4KIDS, and get ready to start a challenge that will change your life and those of young Australian’s living in wheelchairs. The John Maclean Foundation, www.jmf.com.au, holds official charitable status and is registered with the Australian Charities and Not-for-profits Commission (ACNC). JMF is also endorsed as a Deductible Gift Recipient (DGR) by the ATO. Beautiful words from an amazing family. 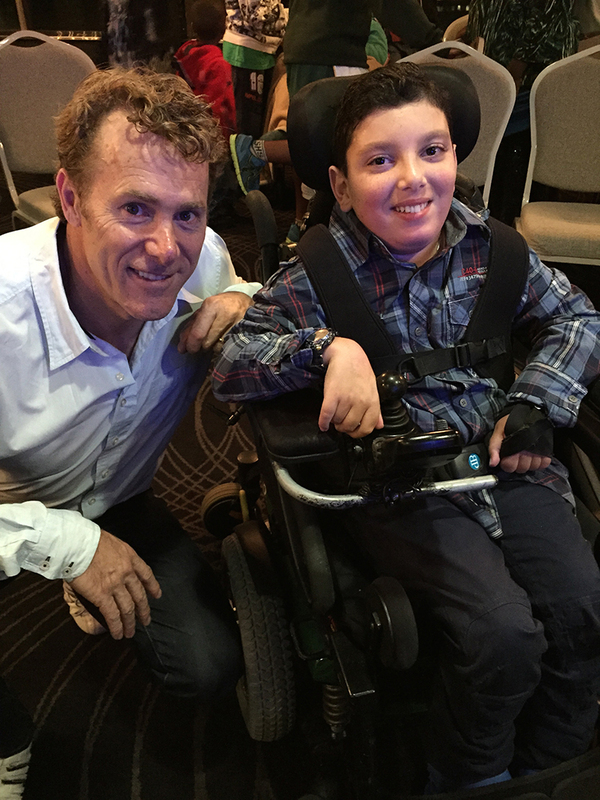 Elias was one of our grant recipients in Brisbane a few weeks back who loved the whole experience and now has a new found hero in John. His mum Kiki sent JMF a lovely note of thanks that we would like to share. 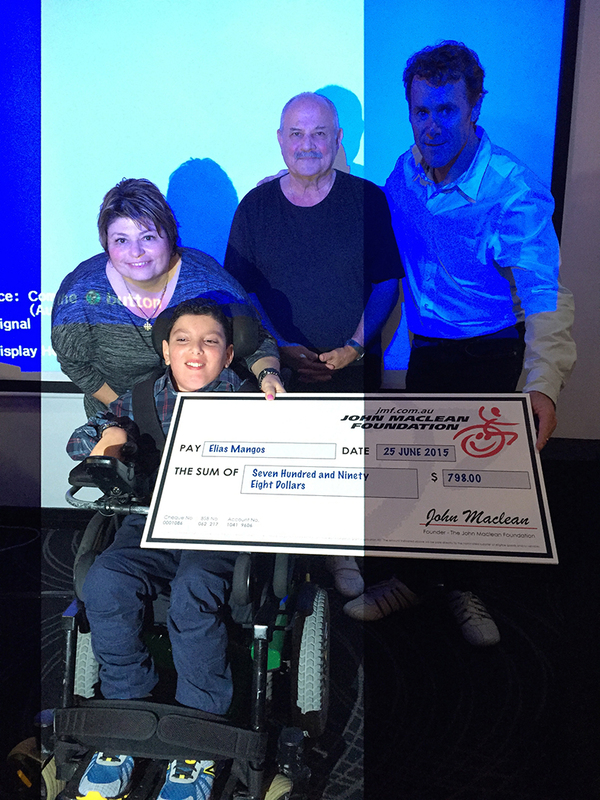 Thank you very much for a lovely evening and what a pleasure it was to meet JMF and all the people that are asscociated with the foundation. It has given Elias a new idol and what an inspirational man John is and Elias looks up to him and talks about him almost everyday. He was soo excited to see the photos that you sent via email and he wants to read his book when it arrives. It was a pleasure to meet soo many people that are very interested and wanting to help these type of children/adults and it has made me think if you need help you just need to ask. 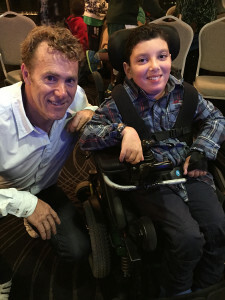 I am not a person that always asks for help so I am glad that I met some extrordinary people on the JMF night that was held at the Urban Hotel Brisbane. It was a pleasure and we enjoyed the evening very much. Thank you very much once again. What an amazing foundation that I didnt even know about before we received this Grant. 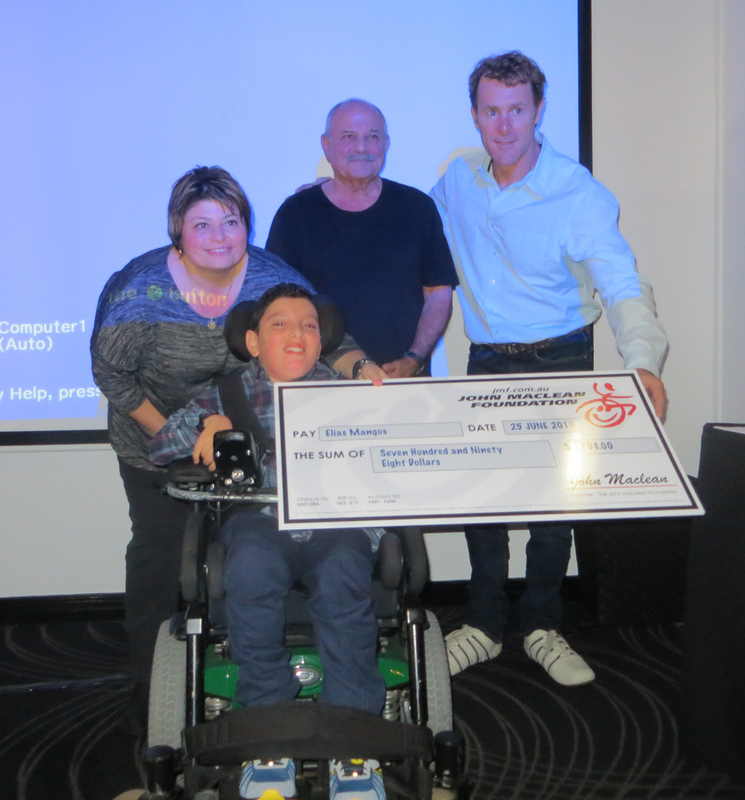 Elias with his mum Kiki and Grandfather at the recent grant presentation in Brisbane. Changing Lives is what The John Maclean Foundation is all about. 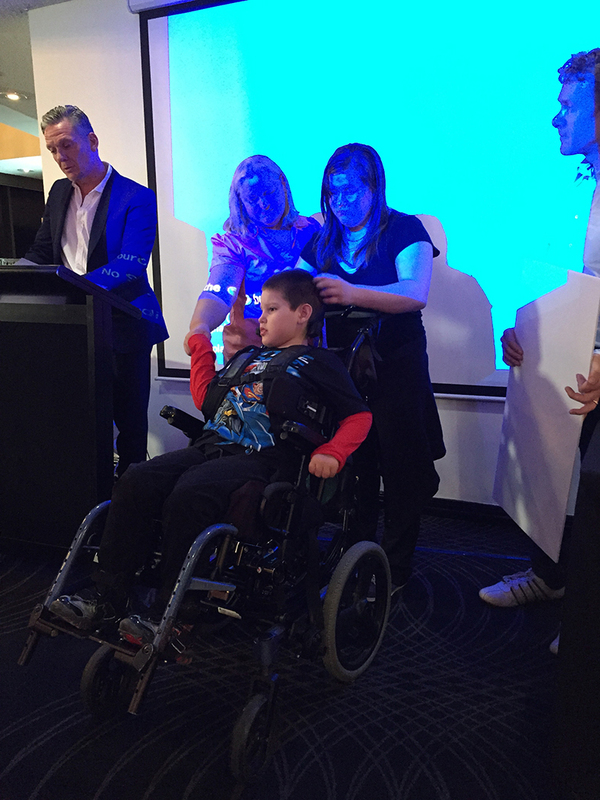 We had the incredible opportunity of changing the lives of six families who have children with Cerebral Palsy last Friday night in Brisbane. Here are some pictures of the beautiful children and their families who were presented with $15,000 worth in Grants. A huge thank you to Hotel Urban Brisbane who donated their function space and catered for our presentation in spectacular style. 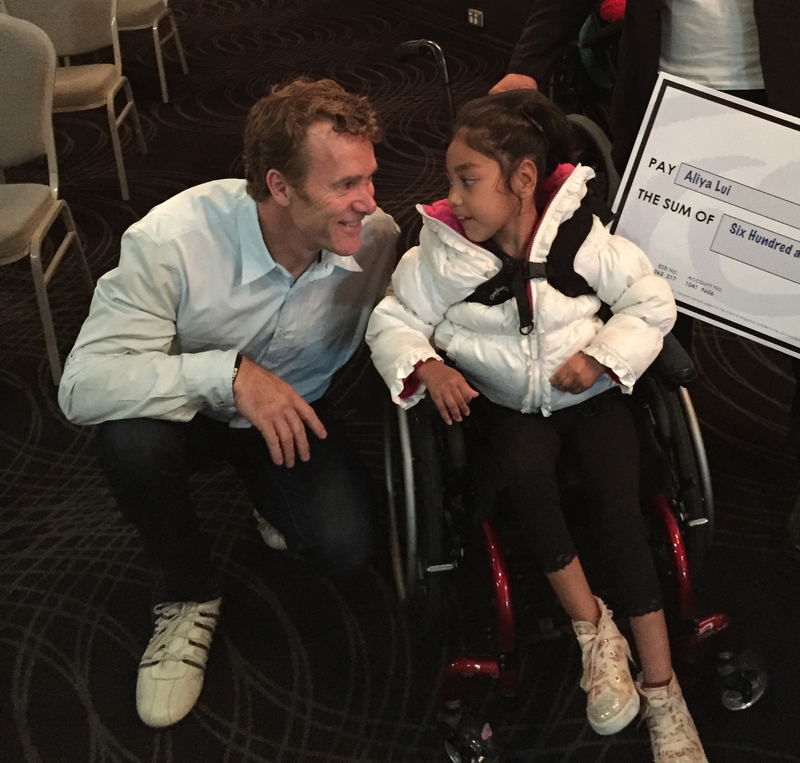 Your support of the Foundation goes a long way towards helping to change the lives of little Aussie wheelies. Ready to Roll at Hotel Urban Brisbane. What an incredible room and outlook for our Grant Presentation. Aliya and John after the presentation. This little princess was one of the stars of the night. 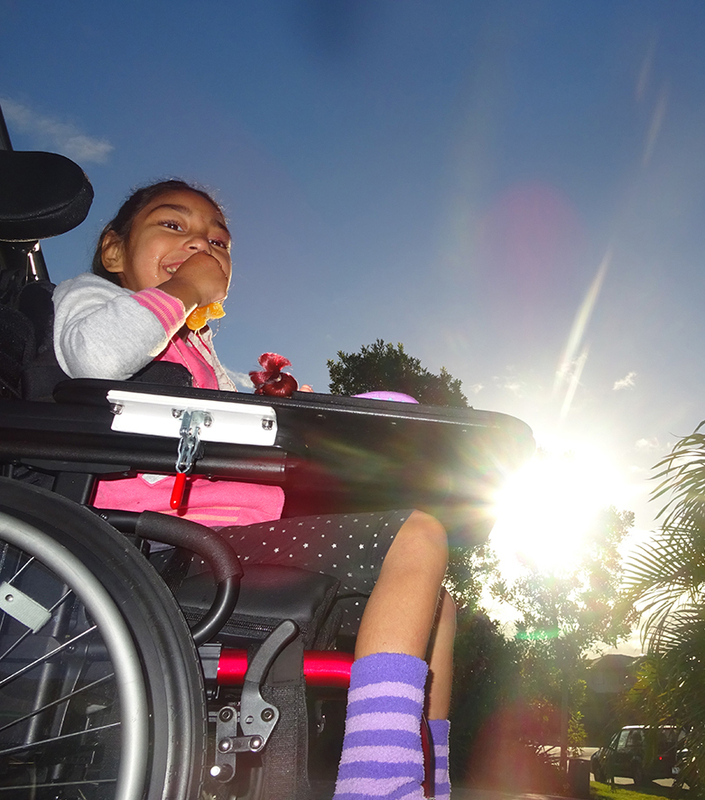 JMF funded the gap that Aliya and her family needed to purchase this new set of wheels. Elias with his mum and grandfather. JMF granted Elias a Contour V Hip abduction brace for night time to achieve better positioning for his hips while sleeping to minimise further hip migration. I am told by Elias’s mum that John is his new Hero! We hope to be able to support Elias and his family into the future. Claude’s eldest brother spoke to the crowd about the changes to their lives these reverse cycle air conditioners would make. These two units will go a long way to improving the everyday life of Claude and reduce the number of hospital admissions and seizures he experiences every year. 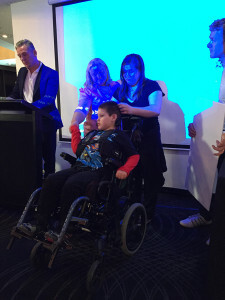 John and Ricky are about to present Cody and his family with a Grant to fund the Daessy mount and accessories that will enable him to better communicate with his family and the broader community. 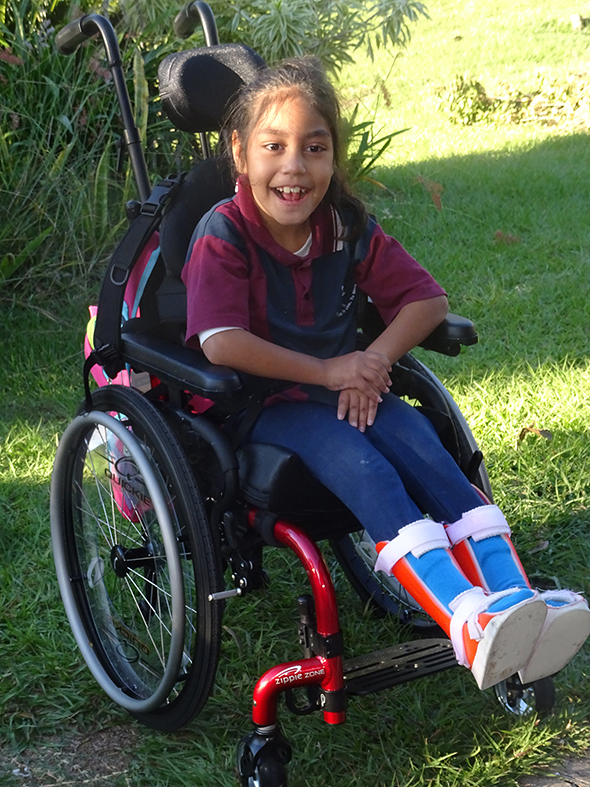 Daelle and her family were granted a ReturnTransfer Platform which will allow her to pull herself up with only minimal help and transfer to her bed or wheelchair in a much safer way. It will also go a long way to ease Daelle’s mum’s chronic back pain. Hannah and her family were granted the bathroom modifications she and her family needs to make it a safe, relaxing and enjoyable environment for them all. The John Maclean Foundation welcomes these children into our Family and look forward to assisting them further as they grow and their needs change. The June Canavan Foundation continues the humanitarian work undertaken by June during her life supporting a mission to create wellbeing and justice through programs in sport, education, health and conservation. 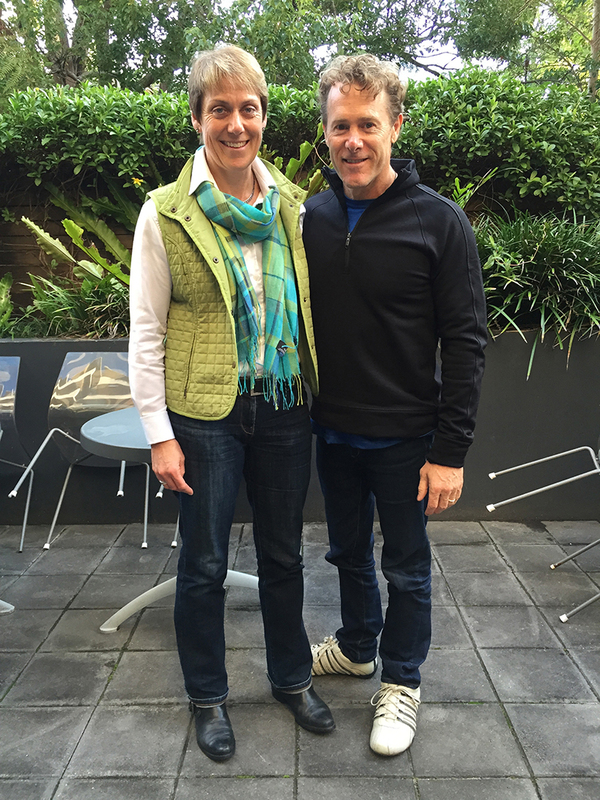 Anne Gripper recently joined John Maclean and the JMF team in Sydney to formally announce the grant. Thanks for the support The June Canavan Foundation! John Maclean thanks Anne Gripper from The June Canavan Foundation for their generous donation.